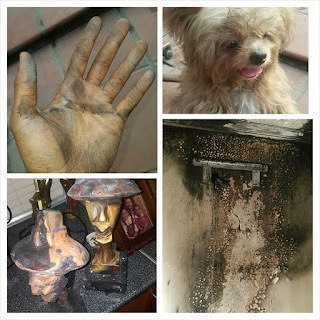 Home News Banky W shares Testimony as he escapes Fire. Banky W shares Testimony as he escapes Fire. Banky W shares testimony after he escapes Fire outbreak on Tuesday, 28th February,2017. Below is a complete version of the story from him.
" @bankywellington - So there's good news and bad news. The good news is... I'm thanking God that I'm alive to give the bad news as a testimony. Thank God for my neighbors and the amazing workers in and around the compound for helping us escape via the balcony, helping put out the fire, and helping with the aftermath/cleaning. Thank God for life. And I'm not even upset.. I'm just grateful for life and health and for the grace and mercy of God on my life. I figure I'm about to have the best year ever so the devil tried to throw a tantrum. But not today Satan. Not today, not ever. Now sit back and watch me be great. By God's grace. Amen. God bless you all."